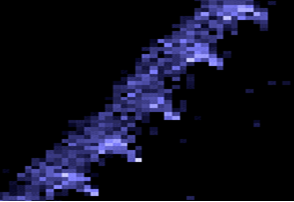 Echograms of data collected with side-looking imaging sonars (e.g., DIDSON, ARIS) often show temporal patterns in the echo traces that are generated by fish swimming through the beam. For upstream migrating salmon, these patterns resemble the shape of caterpillars with legs extending to one side. 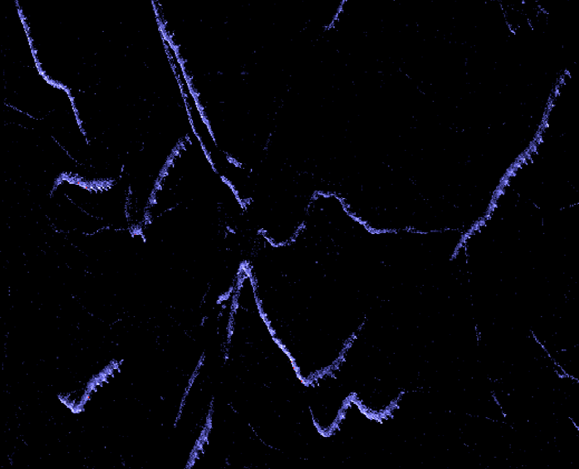 Frame by frame comparison of the echogram with its corresponding images shows that these “caterpillar patterns” are created by periodic changes in the fish image's range extent. Each “caterpillar leg” coincides with a consistent position of the tail within the tail beat cycle. The time interval between successive peaks is thus related to the tail beat frequency. An interesting aspect of this is that this could potentially be useful for species identification and bioenergetics studies. A terrestrial analogy not discussed in the paper: tail-beat patterns in echograms are like animal tracks. Both record differences in gait and body shape over time. 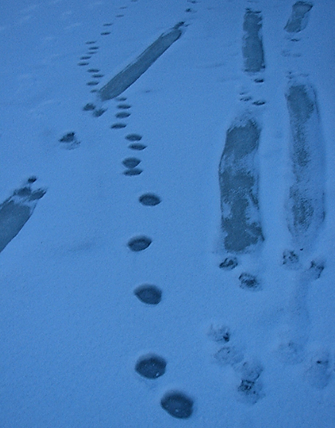 The tracks of three river otters moving along with their characteristic hop-hop-slide, superimposed on a track left behind by a lynx ambling across.